Apple posted its best quarter ever on Monday, driven by its highest-ever iPhone and iPad sales, as well as one of the best Mac quarters ever. Following the company's earnings release, Apple executives took part in a conference call to discuss the quarter, and notes of interest follow. 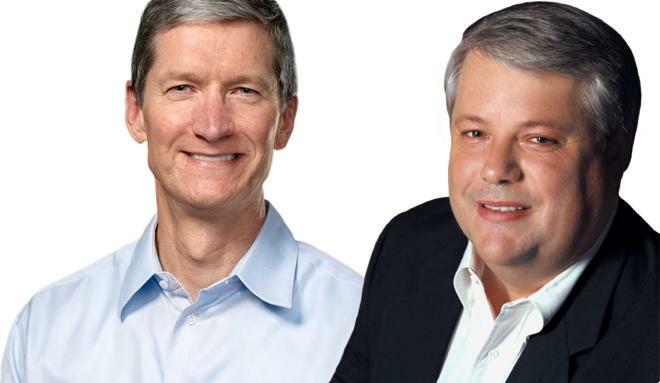 Participating in Tuesday's call were Apple Chief Executive Tim Cook, Chief Financial Officer Peter Oppenheimer, and Corporate Comptroller Luca Maestri. As of this month, 80% of iOS devices are running iOS 7, making it the most popular operating system in the world. Apple ended the quarter with $158.8 billion in cash, up $12 billion sequentially from the previous quarter. iPod sales declined by 52 percent in the December quarter. With the China Mobile iPhone launch, last week was the best week for activations Apple has ever had in China. Cook admitted that demand for the new iPhone lineup, in particular the mid-range iPhone 5c, was "different than we thought"
iPhone sales growth strong year over year in Japan, thanks to launch with NTT DoCoMo in September. Also strong growth in China, Latin America, the Middle East and Russia. New agreement with China Mobile is a multi-year deal. Oppenheimer said that "China is an incredibly important market to Apple." iPhone has highest loyalty rates in the industry. ChangeWave has a 96% satisfaction rate, while Kantar says iPhone has a 90% loyalty rate. iPhone controls 59 percent of U.S. commercial smartphone market. iPhone accounts for 54 percent of North America smartphone web traffic. Supply constraints for iPad in the quarter. Sales were still up 14 percent year over year. Sales "very robust" in mainland China. Strong growth in the Middle East, Latin America, Russia, and parts of Western Europe. Surveys show 97% satisfaction rate with iPad. iPad has a 78% share of U.S. commercial tablet market. Nearly every team in the NFL used iPads as playbooks this year. More than 750,000 iPads have been sold to K-12 students in the state of Texas alone. iPhone accounts for 78 percent of North America tablet web traffic. iMac and MacBook Air saw particularly strong growth during the quarter. Apple was "very pleased" to see such strong results for the Mac, while total worldwide computer sales fell 6 percent. Macs have gained marketshare in 30 of the last 31 quarters. Apple earned $4.4 billion from its iTunes services. Record billings of $4.7 billion on iTunes, driven by the App Store. Software and services revenue hit $2 billion, up 26 percent and representing a new record. This happened despite the fact that many software options are now free with new purchases. App Store has 1 million apps in 24 categories. Cumulative apps have surpassed 65 billion. 130,000 applications have been developed in Greater China, specifically. Apple's iOS App Store commands 67 percent of global revenue from apps. $7 billion earned at stores, up 9 percent year over year and reaching a new record. 6 stores were remodeled and 4 new ones opened during the quarter. 166 stores are now located outside the U.S.
With an average of 418 stores, average revenue was $16.7 million, up from $16.3 million a year prior. Apple stores saw an average of 21,000 visitors per week. Apple has guided for between $42 billion and $44 billion in the current March quarter. That compares to $43.6 billion in the year-ago quarter.